1720~1743: born in Kamigata. He started his career as a disciple of Mihogi Shichitarô, performing in kodomo shibai under the name of Mihogi Shichisaburô. He spent some times in travelling troupes and took the name of Imamura Shichisaburô II  at an unknown date (middle of the 1730s?). 11th lunar month of 1743: Shichisaburô played in Kyôto the role of Taema Tsunaemon in the kaomise drama "Wakamidori Hatsumenbako", which was produced by Arashi Matsunojô at Ebisuya Kichirôbê's theater. 1st lunar month of 1744: Shichisaburô's rank in the Kyôto hyôbanki, tachiyaku section, was jô-jô (superior - superior). 11th lunar month of 1744: Shichisaburô became katakiyaku and played at Hoteiya Umenojô's theater the role of Sekiguchi Kanzô in the kaomise drama "Tanba Yosaku Kameyama Kayoi", which was produced by Nakamura Kumetarô I. 1st lunar month of 1745: Shichisaburô's rank in the Kyôto hyôbanki, katakiyaku section, was jô-jô-(shiro)hankichi (superior - superior - (white) half excellent). He shared the same rank as Nakamura Danzô. 11th lunar month of 1745: Shichisaburô played at Hoteiya Umenojô's theater in the kaomise drama "Toragoyomi Hoteibukuro", which was produced by Nakamura Kumetarô I. 1st lunar month of 1746: Shichisaburô's rank in the Kyôto hyôbanki, katakiyaku section, was jô-jô-(shiro)kichi (superior - superior - (white) excellent). 11th lunar month of 1748: Shichisaburô played in Kyôto in the kaomise drama "Sugamori Hiru-ga-Kojima", which was produced by Arashi San'emon IV; his stage partners were Fujikawa Heikurô, Yamashita Matatarô I, Sakurayama Shirosaburô II, Hanakawa Ichinojô, Sanogawa Hanazuma II and Nakamura Tomijûrô I. 11th lunar month of 1749: Shichisaburô played at Ebisuya Kichirôbê's theater the role of Sanjô Sagoemon in the kaomise drama "Tokitsukazeyasu Keizu", which was produced by Sakakiyama Shirotarô II. 1st lunar month of 1750: Shichisaburô's rank in the Kyôto hyôbanki, katakiyaku section, was jô-jô-(hanshiro)kichi (superior - superior - almost excellent). 11th lunar month of 1750: Shichisaburô played in Kyôto at Ebisuya Kichirôbê's theater the role of Kurimoto Datenojô in Fujikawa Sakoku's kaomise drama "Taira no Miyako Onna Ezôshi", which was produced by Sakakiyama Shirotarô II. 1st lunar month of 1751: Shichisaburô played in the same theater the role of the farmer Yogobê in Fujikawa Sakoku's ni-no-kawari drama "Keisei Kane-ga-Fuchi". 11th lunar month of 1751: Shichisaburô became jitsuaku and played in Kyôto in the kaomise drama "Kaeribana Shinohara Gunki". 1st lunar month of 1752: Shichisaburô's rank in the Kyôto hyôbanki, jitsuaku section, was jô-jô-(hanshiro)kichi (superior - superior - almost excellent). 11th lunar month of 1753: Shichisaburô played at Hoteiya Umenojô's theater the role of Mogami Manzô in the kaomise drama "Futaba no Nishiki Midori no Onikage"; his stage partners were Somematsu Shichisaburô I, Fujioka Daikichi, Sakata Tôjûrô III, Sawamura Kunitarô I, Arashi Tominosuke I, Onoe Montarô and Bandô Sukesaburô I. 1st lunar month of 1754: Shichisaburô's rank in the Kyôto hyôbanki, jitsuaku section, was jô-jô-kichi (superior - superior - excellent). 11th lunar month of 1754: Shichisaburô played at Hoteiya Umenojô's theater in Kyôto the roles of Nejigane Monpachi and Togashi no Samon in the kaomise drama "Fûkigusa Aioi Genji", which was produced by Somematsu Matsujirô. 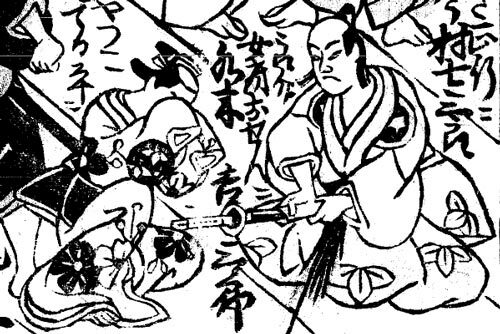 This drama was in fact the first Kabuki adaptation of the puppet drama "Yoshitsune Koshigoejô" [more details]. 11th lunar month of 1757: Shichisaburô became tachiyaku and performed at the Kitagawa no Shibai in the kaomise drama "Tsunomoji Keman no Yurai". 1st lunar month of 1758: first Kabuki adaptation of the puppet theater drama "Gion Sairei Shinkôki", which was simultaneously produced at the Minamigawa no Shibai [casting] and the Kitagawa no Shibai [casting]; Shichisaburô played in the latter theater the role of Oda Nobunaga. Shichisaburô's rank in the Kyôto hyôbanki, tachiyaku section, was two black strokes below jô-jô-kichi [visual]. 11th lunar month of 1760: Shichisaburô played at the Kitagawa no Shibai the role of Kusunoki Masatsura in the kaomise drama "Kiku Nagashi Kokka Taiheiki", which was produced by Nakamura Senzô and celebrated the shûmei of Nakamura Manbê. 1st lunar month of 1761: Shichisaburô's rank in the Kyôto hyôbanki, tachiyaku section, was jô-jô-kichi (superior - superior - excellent). He shared the same rank as Ichikawa Danzô III. 12th lunar month of 1761: Shichisaburô appeared on stage for the last time, in Kyôto at the Kitagawa no Shibai, playing the role of Ayaha Chichibunosuke in the kaomise drama "Karanishiki Miyako no Hinagata", which celebrated the shûmei of Takeshima Kôzaemon IV. 2nd lunar month of 1762: Shichisaburô was expected to perform in the same theater but he suddenly fell ill and had to retire. 29th day of the 3rd lunar month of 1762 : Shichisaburô died in Kyôto. Imamura Shichisaburô II was an important 18th century Kyôto actor, who achieved fame for himself in the Imperial City as a katakiyaku/jitsuaku (jô-jô-kichi in 1754) and as a tachiyaku at the end of his career (jô-jô-kichi in 1761). He was short-sized but had a powerful voice, which helped him being without rival in villain roles. The 29th day of the 3rd lunar month of the 12th year of the Hôreki era was the 23rd of April 1762 in the western calendar. Unknown relationship to Imamura Motojûrô (who was also Imamura Shichisaburô I).